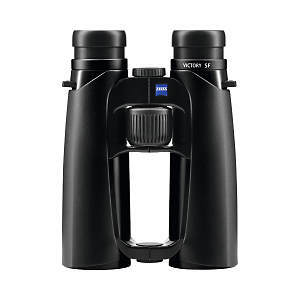 Victory SF 10x42 T* Binoculars (Black) bring upgraded features to the Victory SF line. The focusing system is smoother and more precise; the twist up eye cups have and added click stop; and the armoring is now black. Otherwise, the optics and the ergonomics remain the same. The 10x SF's field of view is still an enormous 360' at 1000 yards, close focus is still 4.9', and the ErgoBalanceConcept yields the same fatigue-reducing balance. Focus from close focus to infinity takes only 1.8 turns. Field of View: 360 ft. at 1000 yds. Dimensions: 6.8 x 4.9 in. Product Weight (oz): 27.5 oz. 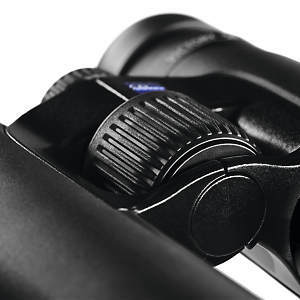 Widest Field of View of any Zeiss Victory model in its class offering 360 ft. @ 1000 yds. in the 10x42 model. New proprietary Ultra-FL glass lenses for up to 92% light transmission, and enhanced, proprietary ZEISS T* multi-layer coatings for ultra-bright, detailed, color-rich images. Phase-corrected Schmidt-Pechan prisms with P* coating for contrast and sharpness of view. Special fluoride containing glass with Extra-low Dispersion properties for reduction of color aberrations to an absolute minimum. 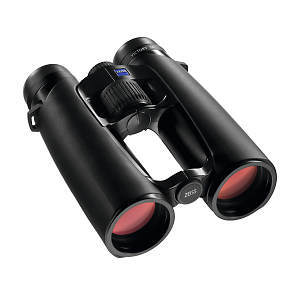 Fantastic Close-Focus at 4.9ft which is great for closer observation of birds or insects. New Smart-Focus (SF) System requires only 1.8 turns to go from close focus to infinity. The position of the new focusing mechanism also reduces finger reach by 65% for a most natural feel. This becomes important during long observations as well as brief encounters when focus speed is of the essence. 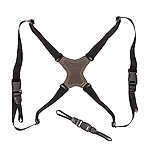 Ultra-light Magnesium body, with the new Triple Link Bridge designed for balance, maximum durability, grip, and comfort. Easy handling twist-out lockable eyecup design with 4 precise positioning click stops (0 - 4 - 8 - 12 mm). Intuitively placed Lockable Diopter adjustment in the front center for easy access. 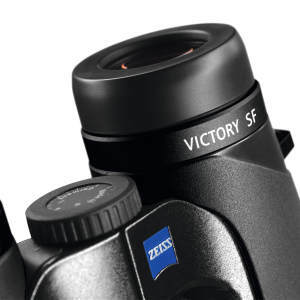 The newly designed Ultra-FL lens system offers excellent image quality as well as the widest field of view of any Zeiss binoculars for maximum visibility. With a light transmission rate of 92% you gain the edge at dusk and dawn or on dark days. Two lenses made from the highest quality SCHOTT glass containing fluoride ensure the best color reproduction. A seven-lens eyepiece with high-transmission elements and field flatteners ensure sharp, distortion free focus all the way to the edges. 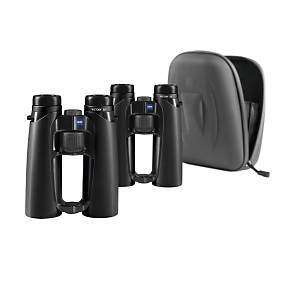 This innovative optical concept allows you to rediscover birding and wildlife viewing. New Smart Focus System Being able to quickly focus on your target is essential and with a wider field of view than any previous Zeiss binoculars, the Smart Focus “SF” concept turns your hands into an extension of your senses. 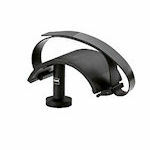 The focus wheel is positioned in the new triple-link bridge which enables you to comfortably place your finger on it. 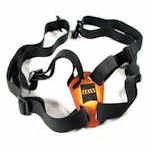 This revolutionary relaxing and natural motion allows you to observe for longer periods without getting fatigued. Additionally, Zeiss redesigned the lens and prism system so that the weight is shifted more towards the eyepieces so it feels like it wants to settle right in front of your eyes which helps balance far better in your hands than other models for less shaking and longer viewing. Its amazing what a big difference this small change creates! 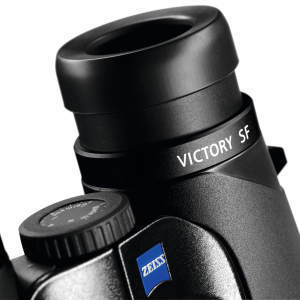 ZEISS T* Lens Coating pioneered by Zeiss themselves is a guarantee of the brilliant, high-contrast images which you will experience above all in adverse light conditions and in the twilight when you focus on your target through the binoculars. The same goes for the dielectric mirror: Over 70 layers prevent light loss in the elaborate Carl Zeiss prism systems. More layers increase the razor-sharp details of the image or guarantee a clear view even in bad weather. Carl Zeiss makes it clear what’s important in premium optics, and has even invented the technology it uses itself. ZEISS LotuTec coating is inspired by a principle from nature: the lotus flower effect: the water repelling characteristic of lotus leaf surfaces to let water drops pearl off and to repel dirt. LotuTec acts as protective coating also making cleaning and care especially easy. 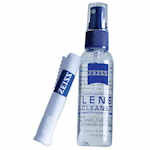 This technology has been used by Carl Zeiss for millions of eyeglass lenses for a long time.